An elegant and beautiful species pelargonium from northern Namaqualand on the north west coast of South Africa. The name, P. oblongatum, refers to the oblong underground tuber which can grow to 15 cm and the plant needs to be kept dry during its dormant period. The flowers are large and the colour is the most beautiful butter-yellow. My photo's were taken during a visit to the National Collection of Pelargoniums at Fibrex Nursery. I went to the Woking Fuchsia & Pelargonium Club last evening. The topic was orchids and I picked up a couple of tips on growing the orchids I have. And there were some lovely slides as well. I did not realise what a large family of plants they are, even bigger than the geraniaceae family. This is a really pretty 'feminine' pelargonium. Honeywood Suzanne is another dwarf frutetorum type zonal and was hybridised by John Thorpe. This was released in 1986 by John's own nursery near Reading, Berkshire, which he ran for over 25 years until he retired in 1993. Honeywood Suzanne has white semi-double flowers with a pink blush to the centre. It flowers prolifically for most of the year. John hybridised several pelargoniums with the prefix 'Honeywood'. After a wet start to the day, we had a warm and sunny afternoon. The last of the dahlias are now in trays drying off in the greenhouse. I also moved the sempervivums under the cover of my small plastic covered greenhouse for the winter. The plastic cover on the greenhouse is fine, but the zip has broken on the roll-down door, but this doesn't matter because they are perfectly hardy, but I need to keep them dry. I love this plant! I first saw it in Australia a few years ago and it was one of the ones I brought back to the UK, and I am so pleased that it survived. It is a frutetorum zonal, i..e it has P.frut﻿etorum as an ancestor. P. frutetorum has a lax growth habit, but does not trail as the ivy leaf plants do. Charmay Hampshire flowers prolifically with pretty pale salmon pink semi double flowers on a dwarf plant. Charmay Hampshire was hybridised by Ken Attfield of Australia - Charmay is the prefix to all his plants. Ken was originally from Basingstoke in Hampshire and I imagine this is where the name comes from. I have given this plant to a couple of the nurseries so I hope they will release it one day so others can enjoy it as much as I do. I have given cuttings to friends and they have all enjoyed growing it. Yesterday I made a start on digging up the dahlias. There are still some to do, but it has rained most of the day here so I hope I can get out in the garden and finish getting them up tomorrow. Most growers of pelargoniums will know the history of Pelargonium triste - it is supposedly the first pelargonium to be grown in this country in 1632. It was originally known as Geranium Indicum noctu odoratum; the Sweet, or Painted, Crane's-bill, and also The Sad Geranium. Indicum because it had been thought that sailors brought the plant to this country from India, without knowing that the ships had also called at the Cape of Good Hope where the plant was collected. The flowers have a sweet night scent, hence noctu odoratum. Sad Geranium, or triste, because the flowers are mostly a dull yellow colour with brown or yellow markings. The plant grows from an underground tuber, with several smaller tubers. These have been used to treat diarrhoea or dysentery. As you can see, the leaves are deeply divided and carrot-like. Pelargonium triste is found in sandy soils ﻿in the western regions of the Cape Peninsular. Here in the UK my plant has just produced leaves and will, hopefully, flower early in the new year. When the flower fades, so do the leaves and then I just put the plant under the bench and forget all about it until September when I see leaves beginning to appear. It really does have a very sweet scent at night, and just one plant will fill my small conservatory with scent during the evening. Shown by Ken Abel at the 2007 BPGS Show at Capel Manor, he won a first with this, and it's not hard to see why. Turkish Delight is a dwarf zonal with bright green leaves which have a wide brown zone. The flowers are single and a bright orange-red colour. Hybridised by Ian Gillam of Vancouver, Canada and introduced in 1984. Pelargonium Kewense (or sometimes Kewensis) was found at Kew Gardens around 1934 and is thought to be a cross between P. scandenss and P. zonale. I think P. Kewense has the most beautiful red of all the pelargoniums. The single crimson red flowers are quite unlike any of the other red pelargoniums. It is a dwarf plant which I find grows into a well branched plant almost by itself and is in flower most of the summer. Although P.zonale is said to be one of the parents, it does not appear to have the usual horseshoe shape zone on the leaf. Pelargonium Kewense is well worth adding to your collection. I've been putting up the bubble wrap on the second greenhouse today - although a larger greenhouse, it is not so high as the first one and so is much easier for me to deal with without resorting to a ladder. We had our first really heavy frost last night - minus 4C. Fortunately I had covered the plants in the greenhouse with fleece so they were not affected. But the dahlias are now blackened, so I will be lifting them this weekend. ﻿An unusual pelargonium in that it grows in shady conditions. P. tongaense is a species pelargonium found only in a small area of north-eastern Natal, South Africa. It can be found growing abundantly under bushy trees in fairly dense shade on sandy soil. The area is hot and humid in summer and warm and dry in winter. The annual rainfall in Summer in this area is generally 600 - 800 mm. The seeds of P. tongaense were first collected in 1955, but it was not thought to be a species in its own right. The area and conditions in which it grows are unlike the conditions in which most pelargoniums grow. It was thought to be a garden escapee and a cross between P. peltatum and P. inquinans as it is similar in appearance to both these plants. However, it was evident that this plant is only found in this one small area of Natal and that it breeds true from seed. The plant was named Pelargonium tongaense in 1983 after the area of Tongaland in which it was found, but seed had been passed to R.H.S. Gardens, Wisley in 1972, named as 'seed collected in Pongoland' . It is an atractive plant with bright red single flowers. The leaves are similar in appearance to ivy leaf pelargoniums. It will grow in sun or shade and requires a very free-draining compost..
As you will know, I am not a Regals person (note the 's'), but anyone who sees this cannot help but be charmed by it. I took this photo at the Pelargonium Display at Wisley this year. The plant was covered in blooms and looked stunning. 'Kimono' was hybridised by Brian Dixon and introduced in 1993. It is a Decorative Regal. They have a longer flowering period and also grow taller that the usual Regal Pelargoniums, which makes them ideal for summer container planting. A Pelargonium Gem from down under. A few years ago Ken Attfield of Australia sent me some of his pelargonium seeds. With great excitement I sowed some of them and watched these tiny seeds from across the world grow into pelargoniums. It is always exciting growing seeds from pelargoniums, but I had no idea what I was growing. Many of them were fairly ordinary and very similar to others we have here. Three I thought different and kept them. One was a miniature stellar, with which I won a second place in the Farnborough Fuchsia & Pelargonium Show a couple of years ago and named it Charmay Pink Ice. The second was a zonal I had not thought much of and planted it in the border until I spotted a brilliant scarlet red peeping between two other plants and found it was one of Ken's plants. I immediately dug it up and I have named that Charmay Scarlet. It has charming primitive scarlet flowers. I hope that one of the nurseries will release it - it really is a lovely plant and the pink compliments the gold leaves beautifully. I've taken cuttings and will let one or two of them have it to see if it is worthy of release. What is really good is that the petals don't scatter as so many singles do. I've still got some of the seeds so will be sowing some more in the spring. I had to go up to the Midlands on Saturday for a PAGS meeting, so was gone all day and back late. A frost was forecast so at 9.30 pm I was stumbling around the greenhouses with a fading torch covering the plants with newspapers. A trick passed on to me by Ken Attfield, and it works! So today I have been putting bubble wrap up. One greenhouse done and one to go. A hybrid ivy leaf plant is a cross between a zonal pelargonium and an ivy leaf pelargonium. It has an upright growth habit. The leaves are shaped more or less like a zonal pelargonium, but have a firmer feel to them, and this one has a zone. I took some ivy leaf cuttings this afternoon. I put these in Root Trainers using a seed and cuttings compost with added fine sand. I find I can keep them in these all winter until I need them in the spring. Root Trainers are available in two sizes - basic 4" deep, or deeper 4 1/2". They are unique propogating cell system providing a deep root run which avoids root disturbance. Each row of five cells opens out like a book. There are ten of these giving 50 cells which fit into a frame. There is a clear cover for those cuttings or seeds that need warmth, but this is not necessary for pelargoniums. I use the clear cover as a tray in which the frame sits and I water into this. I brought Charmay Omega back from Australia a few years ago - it's a miniature stellar with narrow pink petals and a very dark leaf hybridised by Ken Attfield. It flowers profusely in early spring with a break in the middle of summer and then bursts into flower again. I had removed all the flowers before I left for my holiday at the end of September, but when I returned it was full of flowers again. Ken emigrated to Australia in 1960. He and his wife Ruth established a nursery named Charmay, being a derivation of Ken's second name and his wife's first name. This was to be used as the prefix for all of the plants that Ken hybridised, of which there are many. Omega is the 24th and last letter of the Greek alphabet. The second greenhouse was watered today. I had spotted a few whitefly on the angels and scented plants in there, so they were watered with a solution of Provado. I also washed more pots - where do they all come from? Visitors to the greenhouse always want to know what this plant is - they can't fail to miss it! Perlargonium x 'ardens has eight stunning small brilliant scarlet flowers on long stems and has soft lobed leaves. It grows from an underground tuber and is a species hybrid - i.e.a cross between two species, in this case P. lobatum and P. fulgidum. It was raised by James Lee of the Vineyard Nursery in Hammersmith, London around 1820-1822. It needs a very free-draining gritty compost. Cuttings can be difficult, but I have taken cuttings from the thick stems and also from the underground tuber - if you are doing this you need to be sure which way up it goes. Today I watered the plants in one greenhouse and removed yellowing leaves. I have also taken out the growing tips of the cuttings I potted up before I went on holiday. I like to do this about a week after potting on the cuttings, but this time it has had to wait until now. To take the tips out I use a short green cane sharpened to point and just nip the tiny growing tip from the plant. This is to make the plant produce side shoots. I will go over the plants again next week to check I have taken all the tip out. At the same time I removed a few flowers that were beginning to form. I don't want them to flower just yet. ﻿﻿﻿﻿﻿﻿﻿﻿﻿﻿﻿﻿﻿﻿﻿﻿ I've just got back from two weeks in Normandy, France with cousin Sue and her husband Malcolm. We did not easily have access to the Internet, which explains my absence from this blog. We had a really lovely and restful time - good company, good food, good wine - what more can one ask for? At the beginning of the summer Sue had planted window boxes and lots of pots with pelargoniums and everything looked very colourful and 'French' during the summer months. However, winter will soon be here and before we left I helped Sue clear up the garden, and we cut back all the pelargoniums, leaving some which were in terracotta pots outside in a sheltered spot, and the rest we put in the shed - brick built, so hopefully fairly frost free. Sue also brought backs lots of cutting material from the ivy leaf plants, as an insurance. 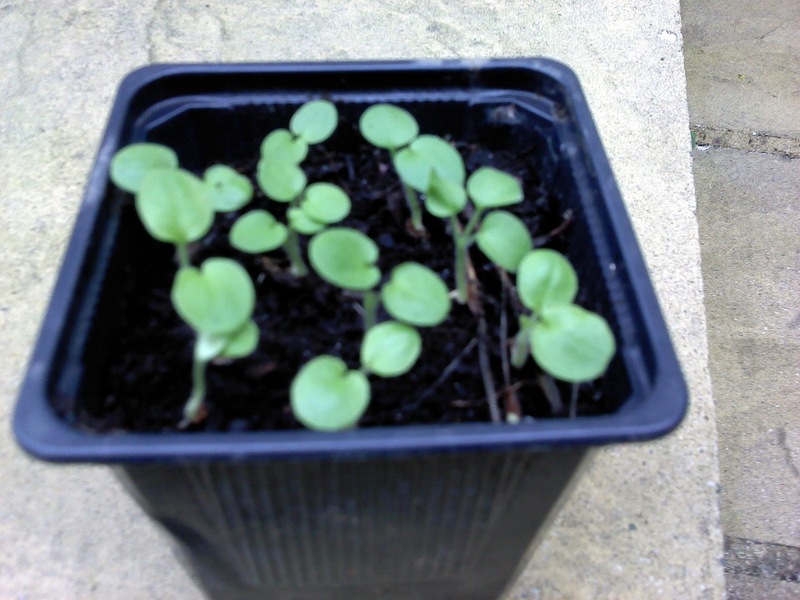 ﻿Whilst we were cutting back the plants, Sue found some very small pelargonium seedlings growing in the pots. She has potted these up and brought them home to grow on. They are obviously zonals and it will be very interesting to see what they are. ﻿I ventured into the greenhouses the day following our return (we got back late at night and in the dark), full of trepidation and fearing quite a few losses. So I was delighted to find hardly any at all. I had arranged for my younger son, Daniel, to pop over and water, but as the weather here was dull and very wet, this was not necessary. My neighbour, Judy, very kindly opened and closed the greenhouse doors, which was an enormous help. I found a few leaves with botrytis and a couple of the new cuttings in their plugs had died, but that was all. What a relief!